I have seen the following Kiss shows: I seen Kiss in Reunion 1996, I bid Farewell in 2000,and then 2003 I went to see Kiss and Aerosmith in Raleigh, NC 9-22-03. 96.3 ROV( Rock Radio Station, VA) awarded me tickets to Greensboro, NC in Nov. 22, 2003. I also attended the Kiss Expo in Charlotte, NC, on Gene Simmons Birthday 8-22-02. The 2000 Show was my favorite so far. I already met Kiss in person: I was able to meet Bruce Kulick at the Kiss Expo in Charlotte, NC 2002. I have his autograph. favourite album: I love them all, depending on my mood. They all have meaning in some form or fashion. favourite song: I like singing and playing the Ace Frehley Solo albums in full Costume and makeup. Rip it out, 2000 Man, Snowblind, & New York Groove. my Kiss-story: Dreams come true with this band, never stop dreaming. I never thought I see Kiss in full makeup with the originals, in 96 it happened. Then I met the "Goddess of Thunder, Leigh, Ron Keel, and Bruce Kulick at the Kiss Expo 2002. 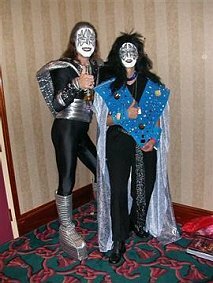 This year (03) I seen Kiss in Sept,I won tickets to see them in Greensboro,NC,I went on the air (Newschannel 18 Martinsville, VA) to promote concert, won costume contest on Halloween as ACE, & will be in the Greensboro News and Record before the concert in Nov. I painted alot of Kiss Fans this year, talked with them, and spent alot of time to KISS ARMY DUTY. I'm the She Ace Kiss Army Ace Frehley Tribute. Rock and Roll will never die.I am proud to be a part of the Kiss History. Kiss tattoos: No tattoos, but I have painted hundreds of KISS FACES, make costumes, play the guitar, and keep Rock and Roll ALIVE. I made a 30 pound Kiss Plaster Show, with mirrors, rhinestones, glitter, and ACE and Paul's faces etched in stone. I am also making Home vhs Recordings and a current Kiss Memory Book that weights about 30 pounds.